This highly individual building is the work of the prestigious architecture studio headed up by Zaha Hadid, who has recently been announced as the Royal Institute of British Architects 2016 Royal Gold Medal winner. An amazing structure built in the iconic city of Moscow, which has been specially designed as a base for the Russian capital’s new technology and design start-up businesses. The structure consists of vertically stacked platforms with a central atrium that channels the light through the building, maximising the available daylight for the benefit of the office workers. 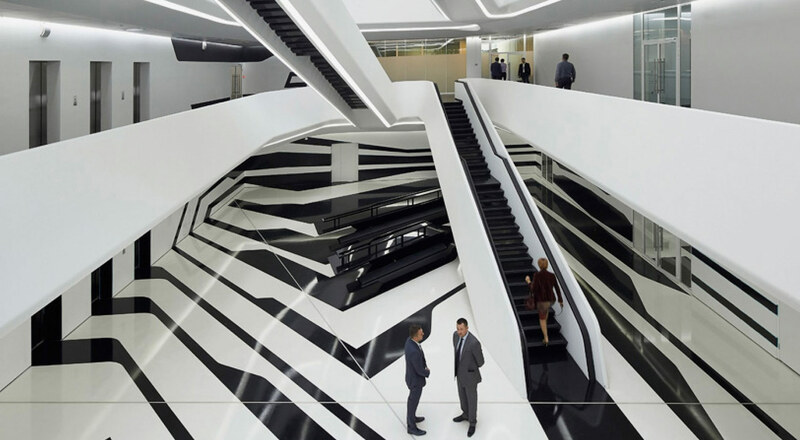 The building features seven floors of office space interconnected via a series of staircases located in the central atrium, in addition to a further two floors, plus parking, occupying a total space of 21,184 square metres and standing at a height of 36.27 metres. The building also has a restaurant located on the ground floor, communicating with an outdoor terrace and relaxation zones where employees can have a coffee or snack and which are conducive to interaction between the companies in the building. The design of this structure is based on the concept of connectivity, a building that integrates different business possibilities; whether large, small or expanding. The spaces are, therefore, arranged in an orthogonal grid pattern with communal and meeting areas in the central zone, facilitating contact between companies and thus promoting collective research. The project was completed this year and a number of companies, both large and small, have already set up shop there.